Shoulder pain is epidemic in the United States. Patients of all ages can be affected. This goes for the younger, athletic crowd who overdo their exercise (weight) routines or in older individuals who have varying degrees of shoulder arthritis, wear and tear of life and who may also be engaged in some type of regular exercise program. Whatever the activity, it is the repetitive action of raising the arm overhead that triggers the cascade to impingement. 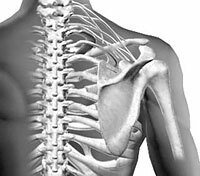 The shoulder joint is one of the most complex joints in the body, in that it performs a number of functions, not the lease of which is being able to move in a wide plane of directions. There are severe structures in the shoulder that are subject to impingement, with the main one being the rotator cuff. The rotator cuff is a tendon that connects four of the main shoulder girdle muscles together. These include the Supraspinatus, Infraspinatus, subscapularis and teres minor. These are the muscles that form rounded shoulder joint and surround the joint itself. 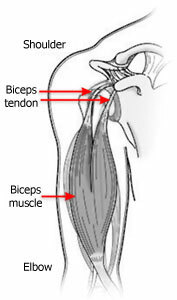 The muscles themselves are subject to sprain injuries as well. The acromion is the front outer edge of the scapula (shoulder blade) and can impinge on the rotator cuff. It also articulates (is connected to) the outer head of the clavicle (the acromioclavicular joint.) The AC joint is held together by a ligament which itself is subject to strain and injury. The AC joint can become strained or even separated, both painful conditions. 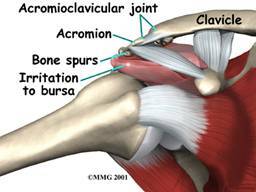 Additionally, there is a bursa overlying the rotator cuff, which can become inflamed, resulting in bursitis. Minor rotator cuff tears can cause pain. Even after surgical repair of rotator cuff tears or various shoulder impingement syndromes, pain can persist. Standard therapy including rehabilitation and anti-inflammatory agents can be helpful. Cautious use of cortisone injections may be tried but repeated injections are not to be encouraged due to the risk of tissue breakdown, bone breakdown or pathological tendon rupture. Treatment of these various conditions can take months to weeks to heal, particularly if surgery is involved. As with any surgical procedure, absolute results are never a certainty. Unfortunately, patients are not uncommonly left with residual pain that has not responded to any conservative treatment. Platelet rich plasma has been approved for use for over 20 years. This is an excellent pre or post surgical options for patients with shoulder pain that has no responded to other treatment modalities. Through careful examination (and possibly an MRI of the shoulder) the doctor determines the structure(s) of the shoulder that are involved. Then using standard PRP technique, with sterile preparation of the skin and local anesthesia, PRP is injected into the tender areas, peppering the PRP around the site that requires healing. The platelets are then activated using thrombin, thereby releasing potent bioactive proteins that begin the healing process. The platelets clump together forming a matrix skeleton that fibrinocytes can migrate into and start laying down collagen fibers to heal the area. Powerful cytokines send out chemical signals that recruit stem cells into the area, furthering the healing process. The PRP graft initially causes a mild inflammatory response with all the different healing blood cells and bioactive proteins in the area. This can cause mild swelling and tenderness that can be controlled with ice and Tylenol products. It is important not to take anti-inflammatory agents for a week prior to and 6 weeks after PRP injection as this will limit the healing process. Ice should be stopped after the first week. The PRP graft healing continues for up to six weeks. If patients continue to have significant pain, a second PRP graft can be given 4 weeks after the first injection. Unlike cortisone, there is no limit to the number of PRP injections that can be given. This FDA approved therapy is safe and effective. The very nature of PRP has an antimicrobial action, as there are white blood cells in PRP that fight infection. Like all injections there can be pain, swelling, injury to adjacent neurovascular structures and failure to control pain although these problems are minimal with PRP. If you have shoulder pain, ask your doctor if PRP therapy could be of benefit to you. Conatact Sarasota Neurology for platelet rich plasma consultation.